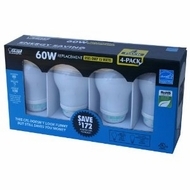 60 Watt Replacement uses only 15 Watts, Save $172 in Energy Costs Per Package. Lasts 8 Times Longer then A Standard 60 Watt 1000 Hour Bulb. Each box contains 4 Compact Fluorescent Light (CFL) Bulbs. Conserv-Energy, Uses 75% less Energy then Ordinary 60 Watt Light Bulb.